Poets Corner and Yinka Says linked up in 2018 to break all boundaries. Their collaboration with Puma was a significant moment in redefining endless possibilities amongst London’s young culture shapers. The shoe was designed with London in mind, the pair used tonal colorways and featured references to London’s bus tickets, nostalgic mobile phones, sweet wrappers and popular takeaway menus. The “No Ball Games” transcript detailing on the heel of the shoe is an ode to childhood memories for all those who grew up in London. Poet and Yinka are powerful individuals within London’s creative community and we are confident that in 2019, they will continue to set standards. Snoochie Shy is a South London raised TV and radio broadcaster, model, brand ambassador and DJ. She has had phenomenal growth in 2018, presenting the Rated Awards, and hosting YO! MTV Raps amongst various other brand deals such as her recent collaboration with JD Sports and Reebok for their Christmas advert. Shy has proven to be one of London’s best and most versatile DJ’s and personalities, her review for UK’s first WingStop branch reaffirmed her multitude of talents. We’re looking forward to seeing what’s next for Snoochie Shy in 2019, we stan! Dancer and choreographer, Sherrie Silver, has had a phenomenal 2018. She is the creative visionary behind Childish Gambino’s controversial and thought-provoking music video ‘This is America’ which has accumulated over 440 million views. Sherrie’s hard work and achievements did not end there and she has since choreographed for Nike, Victoria's Secret and The Hadid’s, landing herself multiple features on Vogue and Forbes Magazine all in the space of one year. Sherrie is the epitome of a female boss and we can’t wait to see what she has in store for 2019. Table Bay is a quarterly exclusive fashion pop-up event ran by young female bosses Maria and Elenia. The entrepreneurial duo set up the business in 2016 as a lifestyle event and platform to supporting emerging talent across the UK, the event is primarily focused on independent fashion brands and music artists but also gives spotlight to a wider scope of London’s buzzing creative scene such as food and beverage companies, nail artists, and hair stylists. This year, they worked with some of London’s best venues pulling in crowds of over 500 people. Their outreach to influencers and VIP guests is unparalleled, making their events a networking hub which is unique to their events. 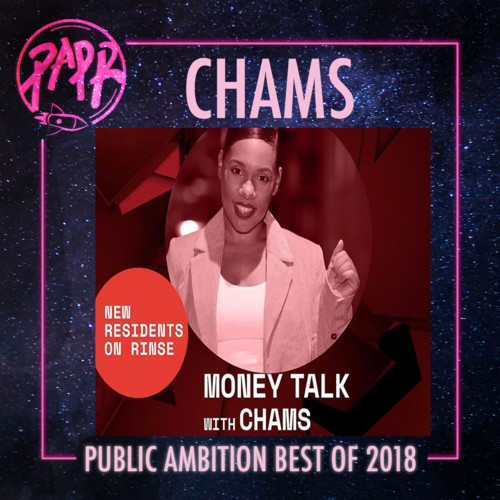 Behind every major artist is an exceptional PR company, this year we’re here to big up Wired PR - a marketing agency founded by Rachel Campbell. From Yxng Bane’s Notion magazine cover and Jimothy Lacoste on Loud n Quiet, to Jorja Smith on ES magazine and British vogue, Wired has really had a phenomenal year. Wired crafted Stormzy’s self funded scholarship for Cambridge University and publishing imprint, providing young people from lower socio-economic backgrounds with opportunities and a platform to set achievable goals and follow their dreams. We truly believe that Wired is one of the leading marketing agencies emerging from London. We look forward to seeing their talent campaigns in the new year. Podcasts have dominated the entertainment industry this year so it’s a special moment when you find one that captivates and resonates with you. You know a podcast is cultivating when you forget you’re listening to a group of strangers through your computer and feel like you’re literally having a Friday night in with friends. That’s the feeling we get from The Receipts Show! One of their most prominent moments of 2018 was their partnership with BBC Radio 1xtra, opening up the show to bigger, more diverse audiences. The Receipts continue to set levels and their journey has been brilliant this year, we’re all rooting for them. We can’t wait to witness their growth and elevation in 2019. Ashley Verse has proven to be one of London’s greatest young talent, a feature article in The Fader describes him as a “regular fixture” in London’s music scene. In a recent collaboration with JD Sports and Adidas’ Creator Series, Ashley explains his journey as a photographer, he attentively breaks down the process of capturing a moment and his dedication to perfecting every shot. A phenomenal moment in Ashley’s journey was his collaboration with Nandos UK this year. The restaurant invited Ashley Verse to travel to Mozambique for their Fight Against Malaria campaign. Ashley is creating new pathways and possibilities for photographers which differ from the ‘norm’ or usual expectation, we’re looking forward to following his journey in 2019. Chams has carved herself out as a multimedia boss! She is a successful entrepreneur, talk-show presenter and talent agent, this year she added radio host onto her resume with her new show on Rinse FM. She is one of the most prominent faces of women empowerment in London, having founded her business “Face for Music” before a lot of us were even considering entrepreneurship as an option. Her new “Money Talks” show on Rinse FM covers all things angel investment, money-making and pitching techniques. Chams is set to inspire a whole lineage of ambitious business-minded individuals. We first met Leah Abbott in 2016 in a video interview where we spoke to her about her modelling career. After moving to London from Bristol, Leah balanced full time work with her social life, in our interview, she spoke about her dream of becoming a stylist/creative director. This year, Leah has hit those targets, touring the world with Jorja Smith, creating the most magical looks. It feels like we’ve all been waiting for Jorja to be styled by Leah, it just gets better and better every show. We’re looking forward to seeing what 2019 holds for Leah, the possibilities are endless and we can’t wait to see her growth. Matthew Wolff designed the most hyped over football kit this year. The Nigerian World Cup uniform had the internet going crazy, breaking records with over 3 million pre-orders and selling out within three minutes. The kit was inspired by Nigeria’s 1994 World Cup jersey and had a real ‘naija’ touch to it - the white and green colour palette and design truly reflected the exuberance and flamboyancy of Nigerian culture. Matthew’s designs turned into an international fashion phenomenon with musicians such as Skepta, Wizkid and Tinie Tempah rocking the kit.